Hey you, did you poo on my head? 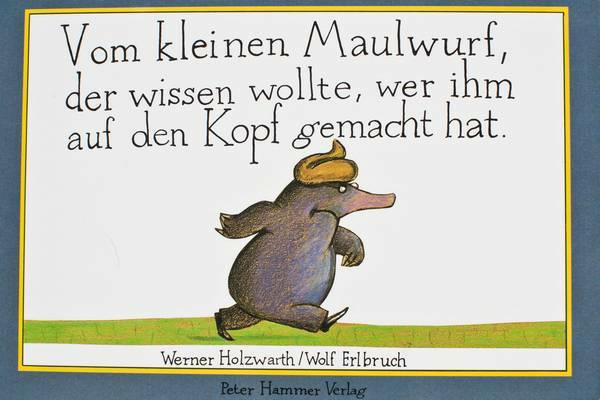 I bought Werner Holzwarth and Wolf’s Erlbruch’s book The Story of the Little Mole Who Knew it was None of his Business well before any of my children could read. If I remember well I bought it when pregnant with my first child based on the recommendation of my Norwegian friend, who said it was one of her daughter’s favourites. The version I have is in French, but it’s been translated from German into many languages as it is considered one of the classics of ‘crap literature’. One day as the little mole pops her head out, she gets pooped on by an unidentified animal. Indignant, she goes on a quest to find the culprit and get revenge. Her quest leads her to question a pigeon, a horse, a rabbit, a goat, a cow, a pig, and finally two expert flies who confirm that she needs to look for a dog. Now this story is fun and engaging, not only because all kids from the age of say approximately two to six love talking about poo, but also because it is a great way to discuss strong emotions like frustration, anger, and relief. I am sure this book played a role in having my kids going on poo hunts when walking in the nearby woods, they would look and try to identify which animal had done their business by the trees or on the leaves. We have several nature guides that honestly we only use from time to time, but it never occurred to me to search for a proper poo chart, and what a mistake! Woodland trust has wonderful resources if you’re hoping to enjoy the outdoors this summer, whether you’re planning a picnic or building an obstacle course! So if you’re looking for a funny book, a story where the little one outdoes the big, or if you want a break from the didactic books you usually get around your child’s potty training years whose message is: ‘be a good boy/girl and do a poo-poo where your parents tell you to’, then read this one! As a former preschool teacher, I can tell you – this book is amazing!!! I’ve never met a child who didn’t like it! 🙂 Good tip!